Jesus foretold two judgments, not one. One of these prophetic judgments has already come true; the other one will come true at the end of the world. Although Jesus talks about these two distinct judgments during the same (eschatological) discourse, the reader needs to key in on the fact that he is referring to two separate judgments. Otherwise, massive confusion results. 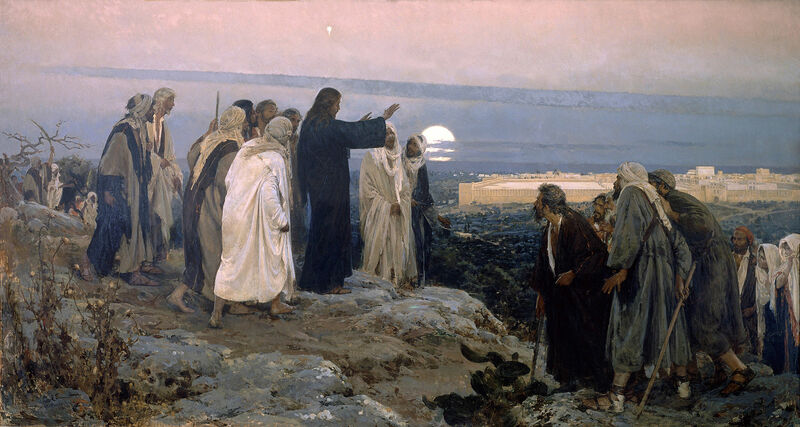 These two prophetic judgments of Jesus are referred to as the “Olivet Discourse.” This famous discourse of Jesus takes place on the Mount of Olives just opposite of the Jerusalem Temple. In this apocalyptic-like discourse, Jesus predicts first a coming judgment upon Jerusalem including the destruction of the Jerusalem Temple – all of which is to take place soon, within one generation; the destruction of the Jerusalem Temple is a “prophetic sign” of the second judgment pronounced by Jesus: namely, the final judgment at the end of the world. See Matthew 24: 1-31; Mark 13: 1-37. “On the threshold of his Passion Jesus announced the coming destruction of this splendid building, of which there would not remain ‘one stone upon another’. By doing so, he announced a sign of the last days, which were to begin with his own Passover (from 585). Therefore his being put to bodily death presaged the destruction of the Temple, which would manifest the dawning of a new age in the history of salvation: ‘The hour is coming when neither on this mountain nor in Jerusalem will you worship the Father’” (from 586). According to the Ignatius Catholic Study Bible, “Jesus’ words [about judgment upon Jerusalem] were fulfilled in A.D. 70 when Roman legions destroyed Jerusalem and brought the Old Covenant to a dramatic and violent end. More than one million Jews perished in the catastrophe” (see notes on Mark’s Gospel, Chapter 13). Thus, Jesus’ first judgment prophecy in his Olivet Discourse was fulfilled with remarkable accuracy. The second judgment prophecy has not been fulfilled, and will not be fulfilled until the end of the world. None of the New Testament books mention the historical destruction of Jerusalem and the Temple that took place in A.D. 70. Consequently, it appears that the New Testament writers were still living in anticipation of the fulfillment of Jesus’ first prophecy of judgment (upon Jerusalem) when the various books of the New Testament were composed. Thus, if it is sometimes maintained that some of the New Testament writers lived in imminent expectation of the Lord’s coming, one is justified in asking which visitation of the Lord is being considered: the yet to occur judgment upon Jerusalem and the whole Old Testament economy?, or the final judgment at the end of the world? The first judgment points to the second. And the first has been fulfilled, and the second is yet to come. This parousia is the Second Coming of Jesus Christ at the end of the world in order to judge the living and the dead. (See Catholic Bible Dictionary, Doubleday, pages 674-677). “Since the Ascension God’s plan has entered into its fulfillment. We are already at ‘the last hour’. ‘Already the final age of the world is with us, and the renewal of the world is irrevocably under way; it is even now anticipated in a certain real way, for the Church on earth is endowed already with a sanctity that is real but imperfect.’ Christ’s kingdom already manifests its presence through the miraculous signs that attend its proclamation by the Church” (no.670). “Since the Ascension Christ’s coming in glory has been imminent, even though ‘it is not for you to know times or seasons which the Father has fixed by his own authority.’ This eschatological coming could be accomplished at any moment, even if both it and the final trial that will precede it are ‘delayed’” (no. 673). REFERENCES/FURTHER READING: An excellent explanation of the two separate judgments referred to in Jesus’ Olivet Discourse is found in footnote 24a of The New Jerusalem Bible, Gospel of Matthew. See also, Dr. Scott Hahn’s essay, “End of the World?,” in the Ignatius Catholic Study Bible, and applicable study/foot notes.